Church of John Climacus, of the Church of Poland, is a church located on Wolska Street of the Wola district in Warsaw, Poland. The church was built between 1902 and 1905 under the direction of Archbishop Hieronim (Egzemplarski), who wanted to commemorate the memory of his son, a painter, who died in October 1902 in Pyatigorsk, Russia. Both father and son have been buried in the basement of the church. The church is built from white bricks, and the architecture mixes the Old Russian style with contemporary Modernism. 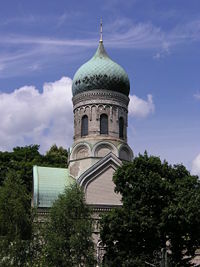 The architect was inspired by churches in the area of Rostov, Russia. The iconostasis was constructed by Alexander Murashko and the frescoes were done by Jerzy Nowosielski, a twentieth century Polish painter. The relics of Holy Martyr Archpriest Vasily Martysz were interred in the church on March 20, 2003. This page was last edited on October 22, 2012, at 20:12.